Mobility options are widely available for dogs that need them today. If your dog requires permanent or temporary mobility assistance, you should have no trouble finding the right aid. From walking sling harnesses to carts, there is something for all pups, yet wheelchairs are undoubtedly one of the best options. In this buying guide, you will discover everything you need to know about purchasing a wheelchair for your dog. This includes our selections in terms of the best wheelchairs for dogs, as well as some useful tips on what you need to consider when choosing a wheelchair. This wheelchair is designed to help dogs with rear leg mobility issues, including pain and weakness. 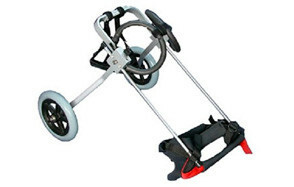 It features an aluminium frame, which is easy to adjust and lightweight, making it easy to use too. It has been designed and tested by a K9 orthopaedic surgeon, which will give you complete peace of mind. It is suitable for dogs that measure between 20 and 26 inches when you start this from the floor to the top of their back at the hindquarters. The wheelchair has been designed with comfort in mind, featuring a padded seat and a double rear leg harness and adjustable shoulder harness. Your dog can still go to the bathroom while wearing the rear harness. Plus, it is suitable for all terrains. 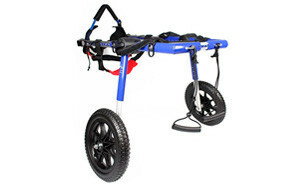 Another one of the best wheelchairs on the market is this product from Walkin’ Wheels. This wheelchair is for dogs with little or no mobility in their hind legs features an aluminium frame, which is lightweight and durable, making it stable yet easy for your pet to move. The wheelchair is fully adjustable in terms of width, length, and height, and it comes with a fully adjustable harness for mobility and comfort. 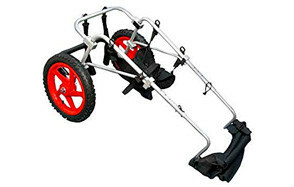 The wheelchair is also suitable for all terrain due to the dense foam wheels. This wheelchair is one of five different sized wheelchairs that Best Friend Mobility has for sale. As the name suggests, it is suitable for every small dogs. It boasts the following dimensions: 5.9 x 3.2 x 1.6 inches. Not only are these wheelchairs great in terms of substance, but style too. They look good, as well as operating efficiently and comfortably, and this is because they have been created by industrial designers who are pet owners themselves, as well as veterinary orthopaedic surgeons. Accommodates pets ranging from under 5 to 175 lbs. This wheelchair does not have the word ‘revolution’ in the title by coincidence; it is truly revolutionary. This is because it is the first wheelchair that enables dogs to voluntary lie and sit down while using it. It is also easier to get your dog out of the wheelchair because the rear can be lowered. It has been designed and tested by an experience K9 orthopaedic surgeon, giving you full peace of mind. Not only this, but it comes with a wide range of features, including an easy clip-on function front harness and all-terrain wheels. This is a wheelchair that has been veterinarian designed, built, and tested. It is made in the USA, and boasts the status of being the lightest wheelchair on the market. The wheelchair is the product of more than 50 years of experience, so you can be confident that it delivers. Not only does this wheelchair give your dog the freedom to be active, but also it features cable leg rings that are contoured with dense foam padding to stop your dog from suffering pressure sores. How Dog Wheelchairs Work And Why Should You Use Them? The way in which the wheelchair works depends on what type of wheelchair your dog needs – full support, rear limb support, or forelimb support. The dog’s rear limbs or fore limbs will either be supported by the wheelchair so that they can walk using their stronger limbs while the wheels do the rest of the work. There are many benefits associated with dog wheelchairs. They can assist with rehabilitation, as well as giving your dog the freedom to live a happy life despite mobility issues. You will be amazed by what a wheelchair can do for your handicapped pet. This is a mere handful of examples that can lead to a wheelchair being required. Let’s take a look at some of the more common conditions in further detail, starting with DM. Degenerative myelopathy: This tends to occur in dogs that are a bit older, i.e. aged between eight and 14-years-old. The condition occurs when there is a loss of connectivity between your pet’s spinal cord and brain. Dragging of the feet and excessive wobbling are just two of the common symptoms pets will display when suffering from this type of condition. Dysplasia and arthritis: Joint stiffness is something that dogs will experience if they suffer from dysplasia or arthritis. Dysplasia can be caused due to your dog’s overall health while arthritis is because of old age. No matter what condition your dog has, it can make it challenging for him to be supported by his own legs. Basic tasks like walking or running can be incredibly painful, which is why a wheelchair is advised. Intervertebral Disc Disease (IVDD): This is a common condition that is caused by the deterioration or displacement of the cushion between the spinal discs. This is a painful and uncomfortable disease that can impact any type of dog. Paralysis or weakness of the legs may happen depending on the level of damage. The stage of the condition will determine what type of wheelchair is needed and what for. For example, in the early stages, a wheelchair may be used for rehabilitation. However, it may become a tool required for your dog’s daily needs if your dog becomes paralysed because the damage is so severe. Will All Dogs Benefit From A Wheelchair? No – wheelchairs are not designed for all dogs. They are only suitable for dogs that have mobility issues. There is no need to purchase a wheelchair for your dog if it can move freely with ease. If you are unsure as to whether a wheelchair would be right for your dog, the best thing to do is consult with your vet. What Makes A Good Dog Wheelchair? The towel test is one of the best ways to determine what sort of wheelchair you should be looking for. In fact, this is something that most canine wheelchair manufacturers recommend. So, what exactly is the towel test? This is designed to help you determine how strong your dog’s forelimbs are. Basically, you are to support your dog’s hips and abdomen using a long towel. Make sure their feet do not touch the ground. Is your dog strong and can he move forward with ease using just his forelimbs? If so, it is likely that a rear-support canine wheelchair will be best suited. However, if your dog finds it a challenge to take steps or stumbles, a full-body support wheelchair or a forelimb support wheelchair will be better suited. You need to consider the wheels carefully. They need to have a deep tred, as well as being flexible, large, and lightweight. Anything too big will be too difficult to move, though, but equally a smaller tire will get stuck easier, which is why you need to find a good balance. The first thing you need to do is apply a bit of common sense. Let your dog get used to the wheelchair and do not foster anxiety. Let your dog sniff it and get comfortable, rather than diving right in. Some dogs will find the transition very difficult, and so consistency is key. They may even be frightened of the wheelchair, so you need to be patient yet ensure that training is regular. Even if your dog responds well to being in the wheelchair, you should only keep him in it for a short period of time and reward heavily. In between sessions, give long breaks. Once your dog starts to move around in the wheelchair, reward it with praise and treats every step of the way. If you are still struggling to get your dog to tolerate being in the wheelchair, you should speak to your vet or contact a local dog trainer for assistance.